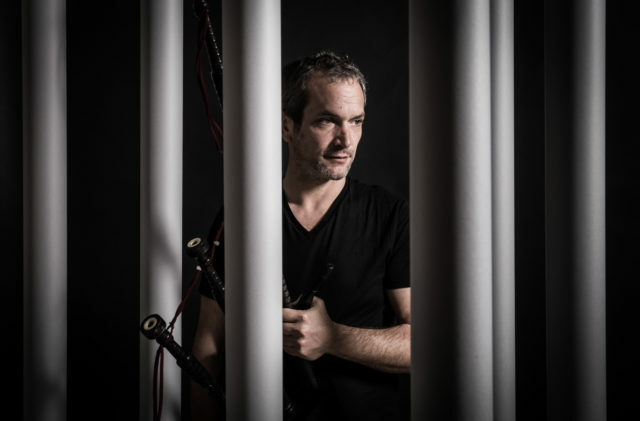 Erwan Keravec is a Breton piper (Scottish bagpipes) whose eclectic path ranges from traditional to contemporary music and improvisation. This encompasses playing solo pieces written for him by such contemporary composers as Heiner Goebbels, Wolfgang Mitterer, Oscar Bianchi, Oscar Strasnoy, Philippe leroux, José-Manuel lopez Lopez…; leading a piper quartet, SONNEURS, playing pieces written by Wolfgang Mitterer, Susumu Yoshida, Samuel Sighicelli, Pierre-Yves Macé; free improvisation with Mats Gustafsson, Beñat Achiary, Audrey Chen, Julien Desprez, Jean-Luc Cappozzo, etc. ; and writing and playing music for modern dance companies (Boris Charmatz, Emmanuelle huynh, Gaëlle Bourges, Mickaël Phelippeau…). Can you talk about your background – how did you start playing bagpipes? I grew up in a traditional culture in Brittany. I learnt to dance and to play for dance. There are two practices in this tradition: the bagad (an orchestra with Bagpipes, bombards and percussions), in which I learnt how to read the music and to play in section, and the traditional duet that I still practise with my brother, and where the music is not written. I started to put tradition aside a little when the bagad I played in met a big band of jazz. It was my first step in improvisation, first in a frame. After that, I started to play free music. And it’s what I still play. Bagpipes are associated with several west European musical traditions, from France to Scotland. Can you talk about the folk traditions and your interest in them? Bagpipes are a family of instruments. All have a bag use for the continuity of the sound when the musician inhales. The bagpipes I play are Scottish bagpipes. These bagpipes were imported into Breton music a century ago. Of course, I’m curious about the music played by others bagpipes. A few years ago, I invited a bagpiper from Iran and another from Algeria to play with me. My idea was to explore those different instruments one by one, the different practices and relationships with traditional music. But, in my own work, traditional music is not my subject. How do you recontextualise these into modern, avantgarde performances that you do – incorporating drone and sound spatialisation? A few years ago, I decided to work only on new music with no reference to traditional music. Just for curiosity: what kind of music can this instrument play if there is no relation to tradition? I work with improvisers, with composers and choreographers. Despite everything, I still consider myself as a heir of this culture. For me, there are two possibilities to consider in traditional music. Either it’s the repertoire – you play the music, melodies, dances as the previous generation, or, it’s a relation to the music, a way to hear music. That is my heritage. What role does music research play in your work, and could you describe such research process on one of your projects? I decided to work with composers in order to play different musical forms. I didn’t expect they would find extended techniques I hadn’t found myself. But, composers showed me different ways of music. An important piece was the Continuum of Ligeti. I got fascinated by the line of the composition: no return, just one way. When I heard this piece for the first time, I also listened to another piece for a clarinet solo played by Louis Sclavis. The velocity of the playing gives the impression of two simultaneous sounds. I wrote a piece Mina inspired by these two pieces. What is your relationship to theatre and theatrical expression? I started to work with choreographers around the same time as with free music. Before this, the music I’d played was melodic tunes. Choreographers changed my understanding of the temporal frame. When I perform with dance, I’m always on stage. I’m not the musician playing in the background only, but I’m interacting with the dancers. This situation questions the music I can play because I’m in action. Can you talk about your new work, Extended VOX for 1 bagpipe, that involves a 24-person choir? Since 2010, I’ve been playing in a duo with Beñat Achiary, a singer from Basque country. Beñat and I improvise. It was my first experience with voice. At the same time, I started to work with contemporary music composers, first with solos. I decided to delve deeper into working with voice. I created a trio with a soprano and a baritone. I commissioned four pieces by four composers. I really love this project. It looks simple at first sight but it is really complex in its relationship between the instrument and the two voices. Bagpipes are too loud for an acoustic opposition. That’s why I decided to create a new project with a choir. You are performing at the upcoming CTM Festival (on 27 January 2019). Can you talk about your performance there? SONNEURS is really special for me because this band incorporates all the instruments of the piping Breton tradition. At CTM, we will play five pieces composed by French, Japanese and Austrian composers – five different points of view of this instrumentation.